Goodreads summary: "Reader, I murdered him." So OBVIOUSLY I was excited when I saw the summary for Jane Steele because HELLO, I have so much love for Jane Eyre and to have this be inspired by it, but with a murderous Jane, I just could not resist! And I'm so glad I picked this up, because it was SO GOOD! 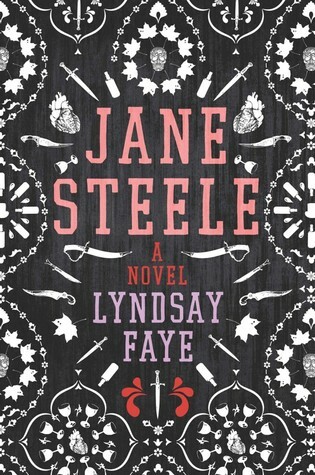 I mean, wow, I was a bit anxious when I started it because of said love for Jane Eyre, and the fact that I was wondering whether or not I would be able to connect to a character who murdered people, but I ended up very much loving Jane Steele as a character and I'm really glad that it wasn't just mindless killing but I could understand why she did what she did. And in some cases I definitely cheared her on because holy wow, EVIL people! Jane definitely has a hard life, it starts with a less than ideal childhood, a complicated family situation and then boarding school, which as in Jane Eyre, is just not run by nice people. I cannot even begin to imagine how you can get out of something like that and still have a shred of humanity left in you, but Jane managed. And in the hardships she makes a friend, but then they flee together and things go South again after that. Which is how she finally ends up at Highgate again and the real fun can begin because YES I SHIPPED IT! I mean, I love Jane for her strength and her loyalty and that she's willing to just do anything for the people she loves and has a strong sense of what is right. And when she met Mr. Thornfield, Sardar Singh and Sahjara, I was just happy that she was finally with people who appreciated her, and Sahjara is an adorable little girl who has been through a lot, it made my heart happy to see her and Jane interact. But now let's talk about Mr. Thornfield: I totally adore this man. He has this amazing big heart and sees all the good in Jane and her flaws and just takes it all. I loved his sardonic humour and the way he is with Sahjara, because you can just feel his love for the people at Highgate shining through in the thing she says. I loved that he and Jane both have dark things in their past, but together they find a way to deal with them. Basically, they were just better together and I totally shipped it and wanted to yell JUST KISS ALREADY and had tears in my eyes and just ALL the feelings. So yes, I'd definitely recommend you read Jane Steele. I love the voice that Lyndsay Faye gives Jane and the whole mystery surrounding Highgate and Mr. Thornfield. And I had lots of feelings over the romance and the ending totally made me smile because what Jane describes must be the best feeling ever! I am SO excited about this book--and so happy to be seeing it well-received so far! I absolutely adore retellings with a "twist"--Pride and Prejudice and Zombies (the trilogy) is what got me into retellings to begin with, and I just... Yes. This book sounds right up my alley. Thank you so so much for such an awesome review! Glad to see your review on this because I'm really interested in it. Thanks! Glad you loved this one, too -- I really liked it and found it so charming and unique! I completely agree re: the romance!! I never really got into Jane Eyre and I was never able to finish it. Jane Steele, however, sounds great! I may have to go back to read Jane Eyre just to read Jane Steele. I'm really glad to see you enjoyed this! I just found out about this book a few days ago and since then, I've been reeeeally wanting to read it. I started this and then got distracted and decided to wait to read it. It felt a bit slow to me but I would love to get through it one day. I jumped in excitement when I read the synopsis of this book! I'm so excited for this book because I love Jane Eyre so much, and I'm so happy to hear that this story did deliver. Ah, this looks so awesome! I don't think I've ever read a Jane Erye retelling and this may have to be the first one for me. The cover is gorgeous, the plot sounds amazing, and I'm really glad you liked it! Oh man, from your opening sentence I thought you didn't like this one which would have made me so sad because it sounds SO GOOD! I'm so glad you loved it! I can't wait to pick this one up! Great review! Oh yay! I'm so glad you loved this book. I really am interested in it. Looks awesome and with your rec I'm sold. Awesome review! I really wanted to read this one already and now I do even more! I'm reading this right now, and it's really good! Holy crap, this one sounds so good! I gotta check this out. Great review.